A new release from one of our very favourite distilleries, Springbank in Campbeltown. 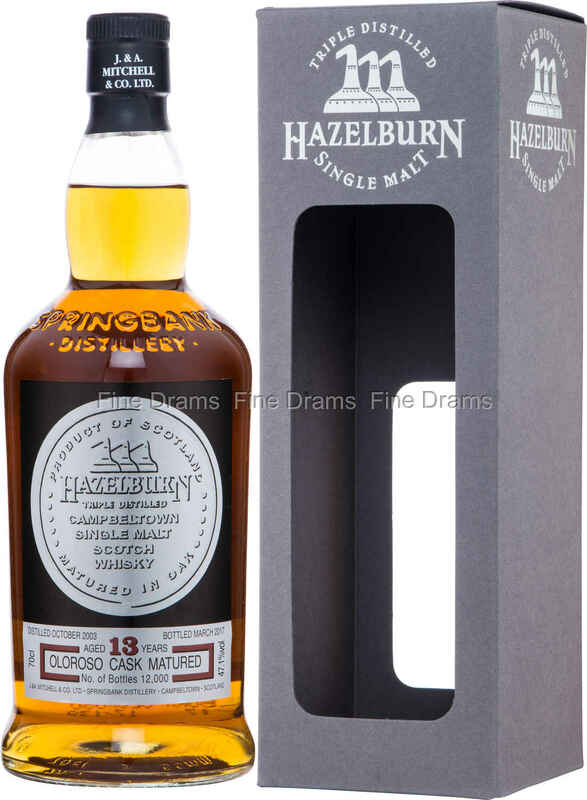 Hazelburn is the triple distilled variety produced by the Mitchell family, a revival of a sadly lost distillery. The spirit sits somewhere between a Lowland and a Campbeltown malt in style. This particular bottling, launched in 2017, was matured exclusively in Oloroso Sherry casks. This maturation has given the naturally floral and subtle spirit notes of dried fruit, toffee, and sweet wine. The slight tinge of Campbeltown funk remains throughout. A wonderful release from this fine old distillery, this bottling was limited to only 12,000 bottles worldwide. Springbank fans should move fast if they want to try this special bottle. The whisky is bottled at 47.1% ABV, which allows the flavours to really carry, and as always with Springbank, the whisky is both non-chillfiltered and natural in colour. Delicious stuff!